I would like more information about 802 Copperhead Circle. 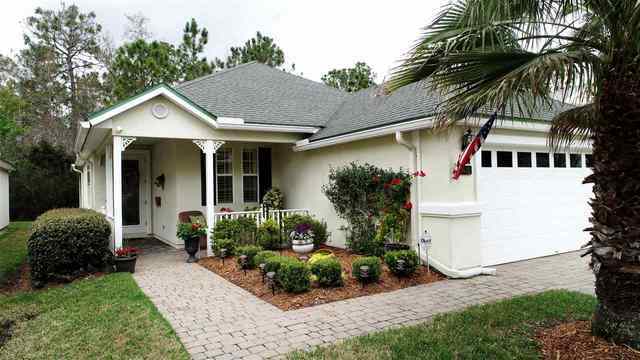 Nestled in a small cul-de-sac in the 55+ community of The Cascades of WGV, is this a gem of Florida living. Shows like a model home PLUS NEW ROOF BY MAY 3RD! Lovely front porch leads to foyer and thru to a large great room with high ceilings. Huge screened patio off the great room facing a preserve area is perfect for relaxing. If you enjoy cooking and entertaining, you will enjoy this gourmet kitchen with new refrig and dishwasher plus breakfast nook and big pantry. Addnl Marketing Remarks: The ''flex'' room is being used as formal dining. but could be a den, office or 3rd bedroom non conforming. Home offers beautiful window treatments including shutters. There is a large master suite and a guest bedroom to complete this beautiful home. Enjoy no yard work and all the amenities this 55+ community has to offer. This home also has a transferable termite bond. Directions: I-95 to Exit 323. West on International Golf Parkway to first light and right on World Golf Village Blvd. Travel for 1.3 miles to end and turn left to security gate. Copperhead is on the right.